Here you will find ready-to use diode laser systems. The lasers stand out due to low operating current, precise optical power control, simple driver design, and high lifetime. The diode laser systems are available with different powers; the wavelength ranges from red to NIR. With the help of Raman spectroscopy, the material properties of semiconductors or pigments, for example, can be very precisely analyzed. As the ideal excitation source, spectrally narrow-banded diode lasers are particularly well suited. The LS-1 and LS-2 VBG®-stabilized laser sources were developed by PD-LD for precisely this purpose. Configuration. The LS-1 and LS-2 VBG-stabilized laser sources are available with the following standard wavelengths: 647 nm, 785 nm, 830 nm, and 1064 nm. Further wavelengths are available upon request. Coupling the laser beam with an optical power of up to 1 W is done using an FC/PC plug. The laser systems can be used immediately and are easy to operate. The parameters can be set either directly on the system or using a USB 2.0 interface. SERDS. Shifted excitation Raman differential spectroscopy (so-called SERDS) is a further development. With the SERDS method, Raman signals can be separated from the background noise. The signal-to-background noise ratio is significantly better than in Raman spectroscopy. The SERDS principle is based on the excitation of the Raman effect with two wavelengths that are spectrally very close together at a distance of the full width half maximum of typical Raman lines of liquids and solids of 0.25 nm. The laser wavelength of the LS-1 is stabilized by the use of a volume Bragg grating (VBG) at a precision of ±0.5 nm. Across an operating temperature range of 0°C to 40°C, a wavelength stability of ±0.005 nm can be achieved. At the same time, the optical full width half maximum is reduced to <0.1 nm. 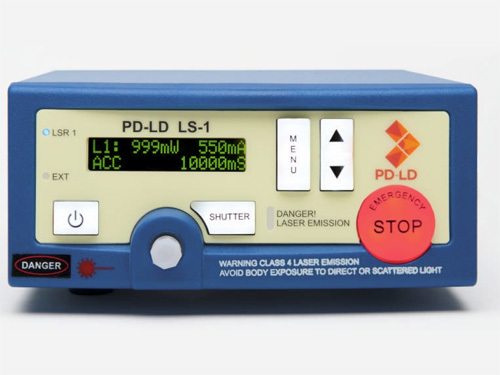 The LS-2 delivers a SERDS laser line pair with a wavelength difference of DL = L2 - L1 = 0,1..1.0 nm. The wavelength tolerance here is also ±0.5 nm at a stability of ±0.005 nm.